GoodSync Ent 10.9.19.5 Portable » SoftLab-Portable.com - Portable Soft! Click the Analyze button and review the proposed changes. Click the Sync button. Your Files Are Now Synchronized! — Yes, it's that Easy! GoodSync 10 now offers even more cloud storage and service providers; all those found in version 9 (as beta feature), plus OneDrive Office 365 and Box.com, BackBlaze B2. No matter your storage preference, GoodSync 10 has you covered. Maximize your security and include encryption on the destination as well. AES with 256-bit key is used for encryption, with all file blocks chained. Random salt is applied, so different encryptions of the same file will produce different results. File size will increase by exactly 32 bytes. Improved peer-to-peer (P2P) connectivity with block level incremental data transfer allows you to enjoy even faster backups - saving you time and increasing productivity. In our own internal testing, we saw increases in transfer speeds as high as 400%. Deletion Propagation can be turned off for 1-way Backup jobs. User-Initiated and Real-Time Sync - Analyze Changes, user reviews changes, Sync to commit changes. Real-Time: files that have changed are synced immediately, or after custom delay. See On File Change option in Job Options. Block-Level Delta Copy - can send over only changed blocks of big files, thus greatly improving transfer speed. 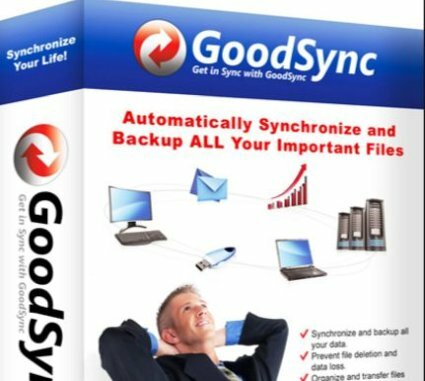 GoodSync Connect P2P must be used for this to work. File and Folder Move/Rename Detection - detect file/folder renames and executes them as Move commands. Conveyor in TCP/IP achieves Line Speed - Even on a single thread, GoodSync Connect achieves line speed in file copy, due to use of conveyerization techniques that use TCP/IP sockets to capacity. Parallel Threads - You can run sync in several threads, working in parallel to achieve faster file transfer speed. Verify File Copying by MD5 - GoodSync can compare files by their MD5 checksum or compare entire file bodies to ensure correct copying. Selective Syncing: Exclude and Include Filters - Files can be excluded from synchronization based on name pattern, size, mod time.